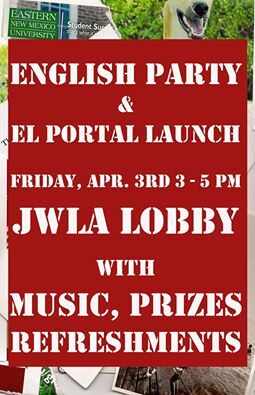 Last Day for El Portal Submissions! Today is the last day for submissions to El Portal‘s fall issue. Write West and send it our way! We will accept submissions until 11:59:59 p.m. If you have something you want to submit, send it to the editor at el.portal@enmu.edu. Please visit our official Guidelines and Terms of Submission pages for official rules. Questions concerning El Portal submissions should be sent to the editor at el.portal@enmu.edu. Write West. Send it our way. We want stories and poems about West. West is a bullet-riddled ’85 Grand Marquis, a gleaming spaceship hovering over Roswell, a cowboy paying for latte with his Amex-card, an alien wondering where in the world to get the golden iPhone. West is where it hurts, West is the rattlesnake you didn’t hear, the dust storm sanding your car, the champagne underneath the Hollywood sign, the checkout line of a grocery store that doesn’t carry mandarin-orange segments in fruit juice, green-chile and cheese burritos from the 24-hour gas station. West is when there’s no West left. West is where you always wanted to be. View El Portal‘s Terms of Submission page for official rules concerning submissions. *Please submit all written work in .doc, .docx, or .rtf formats. With the exception of poetry and art/photography, please limit entries to one story or essay. Prizes will be awarded to ENMU students only. Prizes awarded only in Short Story, Poetry, and Art/Photography categories. When entering a submission, please include a 20-50 word biography to be printed alongside your piece in the event that it is accepted for publication. Cowpokes, aliens, writers, send us your submissions…. If you have questions concerning El Portal web features, feel free to drop us a line at el.portal@enmu.edu.